It’s Monday! And yes, for those that noticed, Monday last week sort of got forgotten. I was just too busy and I do apologise to those that wait with baited breath for my Monday style posts…. so today I have been in bed with flu for days, I have parted with my duvet to bring you todays post. I’m loving at the moment tailored items; tuxedo jackets, beautiful trousers, hats, waistcoats and all the rest. Not all at one, but I think one item that is beautifully tailored can really lift an outfit well. Of course my base palette is always monochromatic (sorry, I’m like a stuck record) but I am loving this seasons bright pops of colour and this is definitely something that I can interprete. 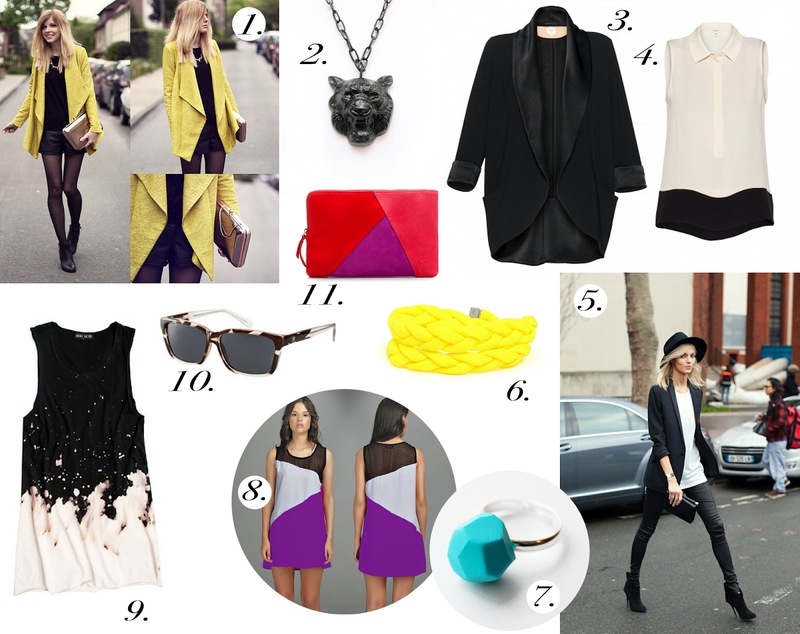 I love the combination of the unstructured bleached dress (9) with a tailored jacket (3) and bright accessories (6, 7, 11). Keeping it grown up, limit colours to either a few smaller items, like accessories or one large item, like a jacket. Perfect collars, pleats and tucks are what makes this look work, there is something to be said for well fitting clothes in shoulders, sleeve lengths and hems.